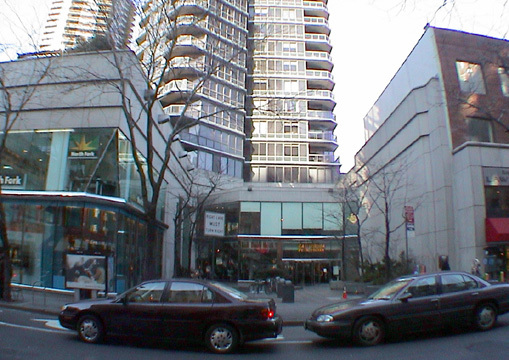 Philip Birnbaum & Associates designed both buildings. 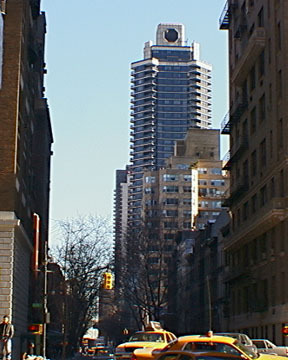 Donald Trump built Trump Plaza at 167 East 61st Street (see The City Review article), a very glossy but attractive apartment tower on Third Avenue with an attractive limestone low-rise base with a rounded glass roof that extended the full-blockfront on the avenue. Lo and behold, two years later in 1986 Morton L. Olshan and his partners began building a 42-story, 234-unit condominium, catty-corner clone! 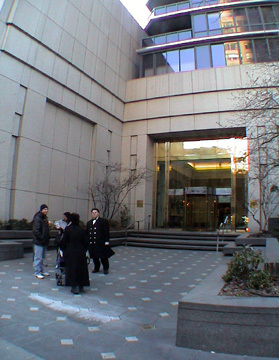 In their wonderful book, "New York 2000, Architecture and Urbanism Between the Bicentennial and the Millennium," Robert A. M. Stern, David Fishman and Jacob Tilove wrote that "Whether Birnbaum's decision to twin his buildings was a result of urbanistic beau geste or artistic laziness would soon become a subject of public debate." Paul Goldberger noted in a column in The New York Times that Trump Plaza "could not be called distinguished, but it surely glitters amid the banality of the rest of Third Avenue." He also observed that it "looks as if it might be the finest building in Caracas." "Whose property was that building's design?" Goldberger asked. Normally, he continued, it belongs to the architect to prevent builders from re-using designs without permission. Justice Greenfield, Goldberger reported, noted that Birnbaum's contract with Trump provided that the architect not use the drawings for another project and maintained that "a knockoff of a known product is unfair competition." Goldberger remarked that the settlement in the case "sets an important precedent, for it is based on the premise that the design of a building is protected not only by copyright but also by the laws and customs of the commercial marketplace." Which three-winged tower is better is hard to decide. The Savoy has a flashier and more attractive base with a brightly colored, trellised sundeck on its setback, while Trump's tower form is a bit more soothing and a bit further removed from the area's hubbub. By contemporary standards, both were far above the norm for the time, although they both have disappointingly low ceilings despite the regular roundup of amenities such as health club, concierge, garage and sundeck.